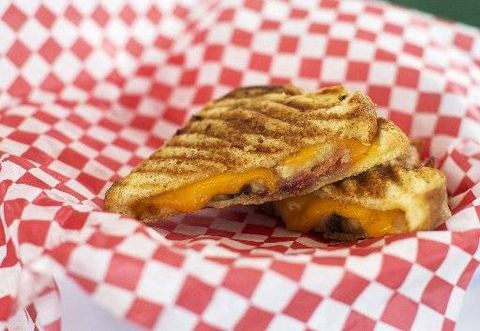 The Elvis Grilled Cheese sandwich is served during the CNE media day in Toronto on August 13, 2014. Under a new policy from the Office québécois de la langue française, "grilled-cheese" is now one of several English terms considered acceptable in French in Quebec. In a province where safeguarding French is regarded as a key to cultural survival, the shift has already stirred one polemic. The office, known by its acronym OQLF, released a list of erstwhile banished terms that are now deemed permissible. Le baby boom can be used instead of le bébé-boum. A grilled cheese can sub for a sandwich au fromage fondant. And pain grillé is toast. The OQLF, with its 15 full-time language terminologists and a staff of 230, devotes itself to finding French replacements for widespread English terms, and sometimes shows considerable imagination in doing so; it coined courriel to replace the ubiquitous e-mail (playing off the French term courrier, or mail) and mot-clic for hashtag, although égoportrait is having a tougher time pushing aside the popular selfie. The agency is ready to relent on other terms, however. It seems that balle molle never caught on in Quebec, so under the new policy adopted this year, softball is okay. Ditto for drag queen instead of travelo. "We've added a certain amount of flexibility," said Jean-Pierre Le Blanc, spokesman for the OQLF. "Our policy will always be to aim to promote French terms, but if [English] terms have become part of common usage, we can accept them. It's part of our linguistic enrichment." While the few dozen English terms remain suggestions for people to use in conversation, their place in official OQLF policy means a restaurant owner with "grilled cheese" on his sign is not violating Quebec's language law, Mr. Le Blanc said. The changes have sparked controversy, not surprising given that debates over language and identity have dominated the province for decades. One linguist, Jacques Maurais, said in an open letter that the "era of decolonization" has ended at the OQLF and the "era of voluntary enslavement" has begun. Mr. Maurais is a former staffer at the agency. In fact, the fight against so-called anglicisms has been part of Quebec's decor going back to the mid-19th century, spurred by the view that anglicization was a sign of weakness of the French-Canadian nation. The concerns were pushed to the forefront with the rise of Quebec nationalism in the 1960s, leading to adoption of the Charter of the French language in 1977. Since then, the OQLF has published countless guides for proper French terms in every field from aeronautics to golf, and its online Grand dictionnaire terminologique gets more than 19 million page views a year. The agency's budget in 2015-2016 was $24-million. "Quebec has had to fight to preserve French despite the very strong pressures of English," said Chantal Bouchard, a sociolinguist at McGill University in Montreal, who has described anglicisms in Quebec as an obsession. "We're hypersensitive about it." Opening the door to some English words – even just a crack – reflects a more relaxed attitude toward language among younger Quebeckers, she said. "Collectively, [francophone Quebeckers] have improved their status economically and politically. There are still insecurities, but there are fewer than before," she said. "I see it in my [francophone] students. People under 30 see English as less of a threat because they don't have the impression they're losing their language." The evolving place of English words in Quebec's French lexicon is even the topic of a conference next spring entitled: "Are we still afraid of anglicisms?" Quebec is seen as something of a global leader in the resistance to English, deploying resources to find French terms while even the French in France do not bother (they use the English term "e-mail"). According to the OQLF's 27-page policy, the agency gives the green light to technical words from English such as mayday and humidex, along with bluegrass and haggis. That's because, it says, they "refer to a reality that is representative of one of the anglo-saxon linguistic communities."